Over time, I’m slowly re-making some of my family’s favorite “junk food” meals into healthy homemade versions. So far I’ve done homemade hot pockets, homemade instant oatmeal, homemade spaghetti o’s, homemade lunch meat, homemade peanut butter cups and homemade donuts… just to name a few. A few weeks ago, I took the one item my kids ALWAYS want to order when we go out to eat and transformed it. Bring on the homemade chicken nuggets! You might think that homemade chicken nuggets are hard, but here’s the thing: they’re not. They’re nothing more than chicken strips cut up into smaller pieces. And chicken strips are nothing more than chicken breasts cut into strips. And chicken breasts come in a package, ready to go (unless you butcher your own chicken first, which you totally can do and I actually recommend doing if you’re really working hard to get your budget down). I usually get chicken from Costco, but also found amazing organic chicken at Butcher Box. Fast food chicken nuggets are fried. If you’re trying to do more homemade and less drive-thru WITHOUT your kids or spouse noticing, then you can’t just bread chicken and stick it in the oven and call it nuggets. You’re going to have to fry them, but you can totally do that with coconut oil or avocado oil and you’re not only making a healthier dinner than the drive-thru, but you’re cooking with healthy fats. Finally – you can fry your dinner without guilt! Salt and pepper are your BFF’s for seasoning, but homemade chicken nuggets require a little more oomph if you’re going to pass the test. Actually, a lot more oomph. Don’t be scared of the amount of seasoning in the recipe. Your chicken nuggets won’t be overly salty, garlick-y, onion-y or paprika-y. They’re going to be AWESOME, and your kids will beg you to make more. 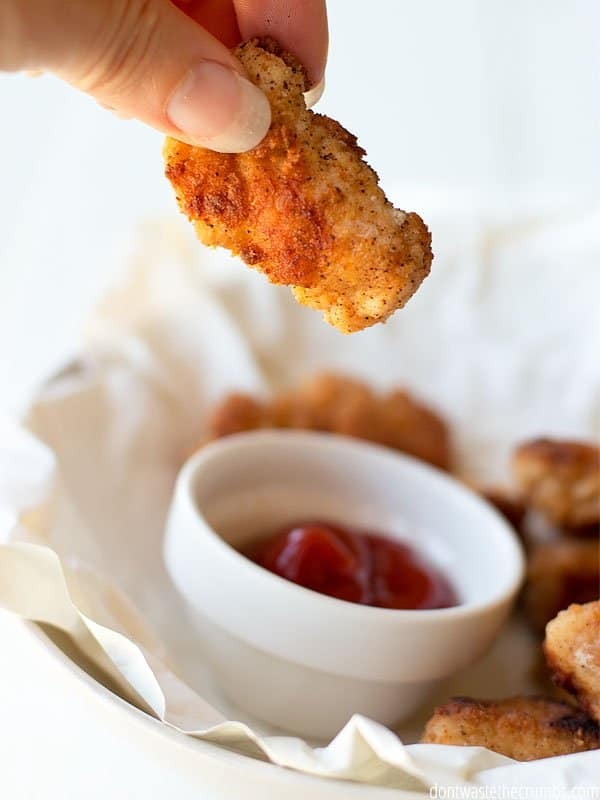 These homemade chicken nuggets are freezer-friendly! This is a VERY good thing, because I used two chicken breasts and my family ate ALL OF THEM. Not a single nugget was left and all of us were wishing there were more! Or I could have made easy potato skins and stove-top macaroni and cheese and call it an appetizer-style dinner, but c’mon – it’s CHICKEN NUGGETS FOR DINNER! How often can you tell your family you’re having chicken nuggets for dinner and say it without an ounce of guilt? Not often, so I let these nuggets be the star of the show for once and this meal was one for the record books. I just made these last week and the kids (and husband) are already asking for more! Which brings me to my point – they’re freezer friendly! Freezer friendly meals are a lifesaver when you’re a busy family. It’s one of the core concepts I share in my free course: 5 Days to Getting Dinner on the Table, FAST. 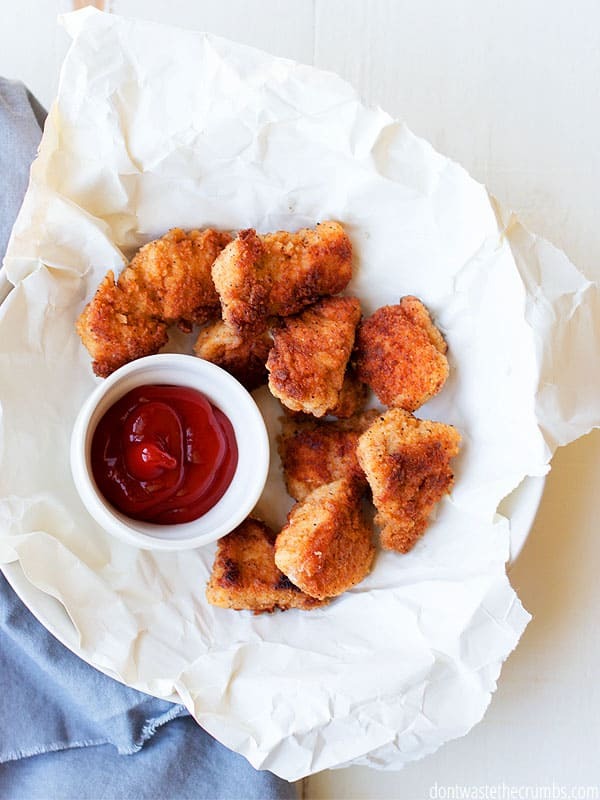 First, make as many chicken nuggets as you want (I recommend doubling or tripling the recipe because you’re going to get requests for these often!). Move the frozen homemade chicken nuggets from the cooling rack and to a freezer-safe container. At this step, I recommend portioning out enough to cover one meal. That way you’re not thawing more than you need later on. To reheat, preheat the oven to 375 and bake for 10-15 minutes! For more freezer friendly meals, and all the prep-work done for you (including meal plans and grocery lists! ), check out the Freezer Family Bundle sale here. Unroll a 12” section of plastic wrap and place it on the cutting board. Place one chicken breast on one end of the plastic wrap and fold the other end over. Using a meat mallet (I have this one) or very heavy spoon or rolling pin, beat the chicken until the entire piece is even in thickness all over. I aim for ½” to ¾” thick. Repeat with the remaining chicken. Cut the chicken into equal sizes, about 1 ½” in size. Preheat a cast iron skillet, or another heavy bottomed skillet to medium heat and add 2 Tbsp healthy cooking oil. In a shallow dish, crack 1 egg and add 1 tsp water, ½ tsp salt and ½ tsp pepper. Use a whisk to mix well. In another shallow dish, measure 1 cup of breadcrumbs, ½ cup flour and 1 tsp each salt, paprika, garlic powder and onion powder. Mix well. Working in batches, move the cut chicken pieces into the egg mixture and coat thoroughly. Then move the chicken to the breadcrumb mixture and coat thoroughly. Add to the skillet in a single layer and cook until the sides begin to turn golden brown, about 3-5 minutes. Using tongs, flip each nugget over and cook until finished and both sides are dark golden brown, about 2-4 minutes. 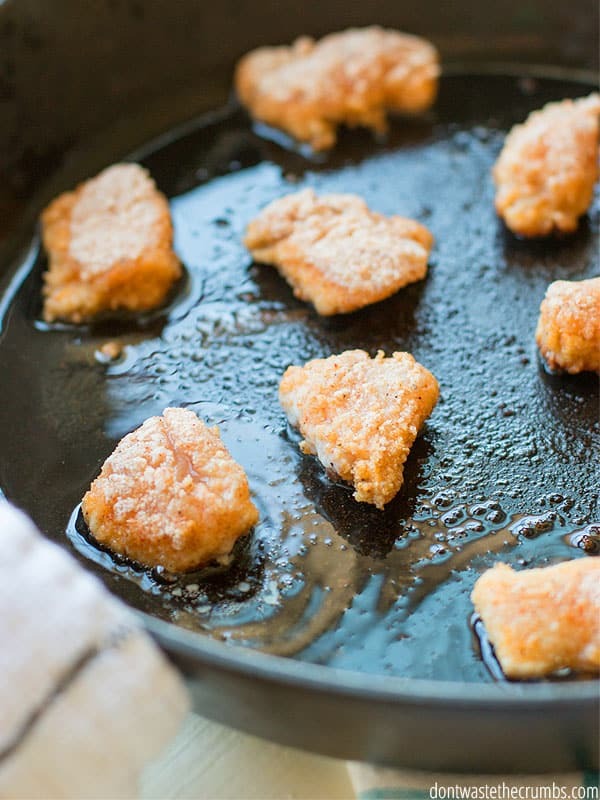 Remove the nuggets to a plate lined with a paper towel or napkin to allow excess oil to drain. Serve warm, or freeze for later. What’s your favorite junk food that you’d love to see made over into real food? My son and I found this recipe this morning and are already looking forward to making it! Thanks! I hope you guys love it as much as we do Kitchen Fairy!! I absolutely looooove chicken nuggets! I usually buy the frozen ones from Foster Farms at either Albertsons or Safeway. My ex-stepdad used to buy a big bag of them for me at Costco. I wish I could shop there, but it seems you have to have a membership, which is a bit spendy! Another downside to the bags I buy is they only last for a few servings. I would buy the big bags again, but the problem with that is I live in a studio apartment, and my freezer is so small! Right this moment, it’s practically stuffed to the ceiling! This is because most of the things I make, I usually freeze half the batches so they last longer. I wonder how I could make a homemade version that tastes like the ones from Foster Farms, without any preservatives? Also, how do they make all those cool chicken nugget shapes? I’m afraid if I tell you how they make the cool chicken nugget shapes, you won’t want to eat them every again. 🙂 These chicken nuggets are really good – I encourage you to give them a shot! And why would you think I wouldn’t want to eat them ever again? I was just curious about the shapes, since if I make the homemade version you’re describing, I’d like to make the familiar shapes. I know one of them is round, or maybe it’s oval, and another is sort of rectangular with a little handle, at least to me that’s what the shape feels like, and I think another of the shapes might be square. I don’t know, I’m just taking a guess. I think nuggets that are made into shapes are highly processed. Couldn’t I try making shapes with your recipe? How would I make them? Would I have to use a knife? Cookie cutters? A special pan? I’m confused! You could try making shapes if you started with ground chicken, but not with chicken breasts. I suppose you could cut the chicken into shapes, but I don’t know that it would hold it. Typically, shaped nuggets are made by blending or processing the meat so it will fit in a mold. I’ve never done it myself so I’m not sure how exactly it would work. I’ve made chicken nuggets by pureeing the chicken and seasonings with some mashed potatoes in a food processor. If you do that, the nuggets can be shaped as you like, and the texture is similar to what you’d get from typical processed nuggets. You could follow the suggestion to just use ground chicken, but I’ve never tried that, so I don’t know how the texture would be without the potatoes. Excited to try this! With a toddler chicken nuggets are basically a staple around here. But whenever we buy them I’m always thinking about how much better (and healthier) it would be if I found the perfect homemade chicken nugget recipe. Can you tell me how many chicken nuggets this makes? Also, in the recipe it says “1-2”, “1/2-1”, etc. for each of the ingredients, can you explain the large range for the ingredients? Is it based on if you use 1 or 2 chicken breasts? I want to get the ratio right. Hi Sarah!! I honestly can’t tell you how many this makes – my kids and hubby are always snacking on them as they come out the pan, LOL! Plus with the different size of breasts, different thickness, etc. If I had to guess, I’d say 25-30 ish? As for the ingredients, if you notice, the range for each one is doubled. Basically, start at the low end. Then if you run low on egg wash or spices, you can make it again. Once you make this recipe the first time, you’ll know whether or not you’ll need to use the low end or high end of ingredient measurements. This will also depend on how much chicken you use too. I just didn’t want you guys to waste ingredients on egg wash or breading, and then not have a use for the extras!! Hi, would it be black or white pepper powder? These turned out fantastic! I’m gluten free so I subbed the flour and breadcrumbs for gluten free flour, breadcrumbs, and cereal. They turned out spectacularly. We even tested a small frozen batch for a midnight snack. These were delicious! I have 4 boys and they all devoured them. But the real test was that my husband and I loved them too! 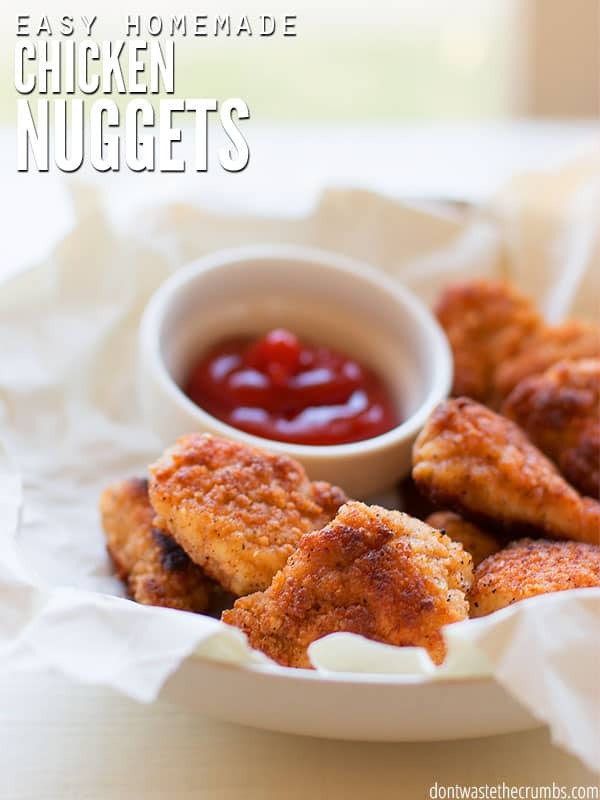 These are the best homemade nuggets I’ve ever made! Thank you so much for the recipe. Even my fussy other half approves ALOT. I can’t sign up to your minicourse though, it keeps failing! I’m glad you like the nuggets! I attempted to sign you up for the mini course. Let us know if you didn’t get an email about it! AMAZING. I couldn’t stop eating them…kids loved them too!! Thanks for posting! You’re so very welcome Robin! I just want you to know that occasionally our family has homemade Chick fil A night and this is our go-to recipe! Actually we had it last night with these nuggets and your potato wedges (and my husband mixed up some mean CFA sauce)! I haven’t tested it personally Robin, but you could probably do either one!